Seed crosses have the same parents, but the progeny can look quite different. intended to be an exact represntation of the cross. 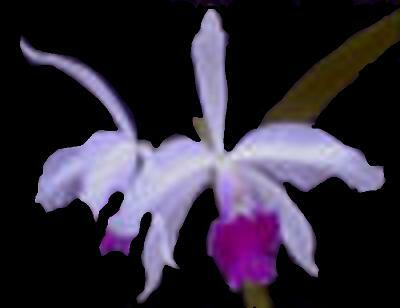 We have remade this classic Cattleya hybrid using exceptional parents. The Blc. Mem. Crispin Rosales `Shining Moment' clone has a huge bloom spike holding 5-6, 6" flowers. C. Horace `Maxima' is a great grower and it's flowers have fine round shape. Named for the mother of a good friend of ours. Award quality here! Full overlaping shape from both parents. We expect the Blc. Tribute to dominate the color. Producing exceptional lavanders on strong growing plants. C. perciviliana `Summit' We used an extremely dark Lc. Love Knot. Similar in shape to the one shown, but dark concord grape in color. Plants are blooming size, some have already flowered. Tall heads of red & orange to copper colored flowers, with an intense red spade shaped lip. Long lasting, waxy flowers. Compact growing plants with bright 2"-3" yellow flowers with red or orange accents. Some pink, peach or orange flowers are also possible. Plants are blooming small in 2"-3" pots & are free blooming on every new growth. Medium sized plants with clusters of waxy deep purple flowers. Vigorous growers & bloomers. Nicely scented. Great growing plants with large sparkling light blue flowers with a deep amethyst lip. Some flares too. Vigorous growing plants with large full shaped floweres in shades of pink, salmon, peache(s), & some yellow with a red lip. All flowers have yellow undertones that intensify the color of the flower. Compact plants are producing heads of 3" + cream to creamy pinks with heavy mahogany spots and a purple lip. 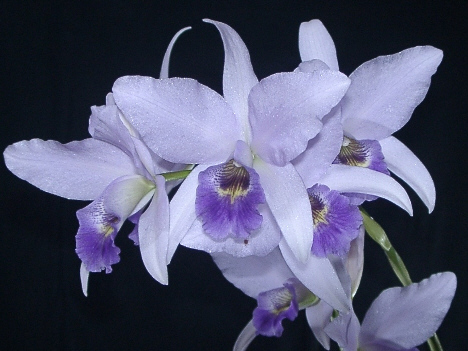 C. Hawaiian Wedding Song "Virgin"
Miniature Cattleya throws 3" powder blue flowers, with a darker blue lip. Blooming season varies. Our awarded flare petal Lc. Love Knot crossed to a huge lavender with red flares & a red lip. The first to bloom is shown to the left. We expect compact growth & large lavander flowers with flares, splashes, & some solid fuchsia. All with that great, C. Walkeriana fragrance. Nice golden yellow flowers with a pink to red lip. Some flowers have a pink picotee on the out side edge of the flower. A good grower. Throwing multiple leads, which means a lot of flowers! Multiple front leads bear 2" plus yellow to orange flowers. These flowers are compact plants & blooms several times throughout the year. C. Sea Breeze is a primary hybrid betwwen C. Warneri & C. Walkeriana. Waxy red & orange flowers with a blood red lip. Very colorful! This cross is great! Combinations of pink, yellow, orange, & white with vibrant flares on tips of the petals. A good grower, throwing multiple leads. Wonderfully fragrant & long lasting. Crossing this large chiffon yellow with a fine white, with a purple lip has been producing 5" chiffon yellow to yellow with a slight blush of pink flowers with purple on the lip.